Q: Can I drive the cars listed on Star Car Hire? Q: Are the TV and Movie car replicas available for Proms and leavers days? A: No, unfortunately we DO NOT cater for Proms or Leavers days unless stated otherwise. Q: What happens if I book a car and it breaks down on the morning of the wedding? A: Unfortunately a lot of cars listed on Star Car Hire are classic cars therefore there is always a slim chance that a car could break down. If this happens we will do our best to try and make alternative arrangements or if time allows, organise another car. Star Car Hire CANNOT be held responsible for any unforseen circumstances including mechanical failure, accidents or illness etc that will prevent turning up on the day. Star Car Hire will only be liable for the refund of payment actually received. Q: Are the doors welded shut on the General Lee? Q: How do I work out prices? A: Prices vary greatly depending on a number of variables, e.g: Vehicle, Your location, nature of event, time required, distance, fuel etc. If you would like a price for any of our cars please email us or call 028 2858 3500 for a quote. Q: Are all the cars available UK wide? A: Star Car Hire can arrange for most cars to be available for events throughout Ireland and the UK however transportation costs will be taken into account. Q: Are all the cars featured on Star Car Hire the real ones actually used in the movies and TV shows? A: No, the cars featured on Star Car Hire are high quality replicas unless stated otherwise. 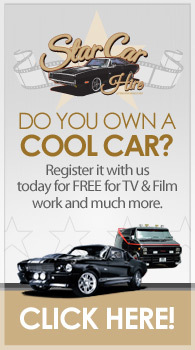 Q: Can I list my speciality/movie car on Star Car Hire? 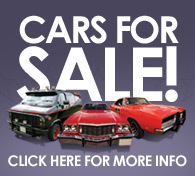 A: Yes, we are always on the lookout for new and exciting vehicles to add to the site. If you think your vehicle might qualify please email us with relevant information, pictures and your full contact information. Listing your vehicle on Star Car Hire is totally FREE!! Q: Can I drink alcohol or smoke in any of the Star Cars? Does it cost to register my vehicle with Star Car Hire? NO: Star Car Hire work on a commission basis therefore do not currently charge a fee for listing vehicles on our website. What kind of fees can I expect from hiring out my vehicle? Each job will differ depending on the nature of the job, location, time required, mpg of vehicles etc. On most occasions we will discuss prices with you before a quote is given to the client. When will my vehicle be listed on the Star Car Hire website? Star Car Hire’s main role is to promote your vehicle(s) online and source paid work. We will often assist in making arrangements for events and aim to make sure that all necessary precautions are put in place to protect vehicles however we accept no responsibility for any damage caused to a vehicle during an event. Vehicle owners are responsible for looking after their own vehicle(s) during any event and making sure that they arrive at the agreed place on time. Vehicles must be clean and well presented and drivers must be polite and as helpful as possible to clients. If a vehicle breaks down on the way to an event it is your responsibility to notify both the client and Star Car Hire immediately. We will try to assist where possible in arranging an alternative vehicle. Vehicle owners are responsible for making sure that your vehicle(s) are fully taxed, MOT’d and fully insured for any event you take on board. Eg. If you plan on using your vehicle for weddings you must ensure that you extend your insurance policy to cover wedding hire / hire and reward. This can normally be added at a small additional charge to your classic vehicle policy. Star Car Hire is not responsible for insuring your vehicle and is not liable for any damage or accidents caused whatsoever. Who will drive my vehicle? Star Car Hire do not usually hire out vehicles for self drive therefore the owner or person responsible for the vehicle would normally be responsible for driving. Sometimes in the case of TV and film work an actor or stunt driver may be required to drive however we would normally ask the client to provide insurance. NOTE: Good photographs are essential in getting your vehicle noticed. If photographs are poor quality they may not be shown on our site. Try and take tight shots filling the frame with your vehicle. Include images from all angles and include both interior and exterior shots. You can upload up to 8 images so take some time and choose your favourites. Remember, good pictures will help promote your vehicle to clients so take your vehicle somewhere nice on a bright sunny day and shoot until your heart is content.